Studying the chart, it’s readily apparent that Android has lost developer support to iOS. Specifically, Android new project starts have dropped from 36% in Q1 to 28% in Q2. 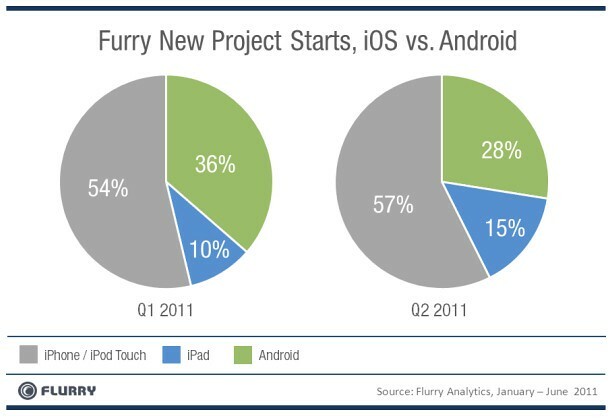 Overall, total Flurry iOS and Android new project starts grew from 9,100 in Q1 to 10,200 in Q2. Of note, this drop in Android developer support represents the second quarter-over-over slide, which follows a year of significant, steady growth for the Google-built OS. Over the course of 2010, Android developer support had climbed steadily each quarter, peaking at 39% in Q4 2010. Twenty million people cannot be wrong, Flurry says, alluding to iPad sales so far. Developers are taking notice, creating over 100,000 native apps for the tablet. The Verizon iPhone, released this January, was a huge boon for Apple’s handset because it “closed the most significant vulnerability in its US distribution, and likely world-wide”, the analytics company noted. “In fact, with its lengthy exclusive distribution agreement of iPhone on AT&T, it could be argued that Apple itself gave Android the opportunity to reach critical mass on other carriers, most notably Verizon. In that time, Google, Verizon and a host of OEMs worked hard and fast to push Android devices as an alternative to AT&T’s iPhone juggernaut. With the iPhone finally launched on Verizon, the pendulum appears to have swung back more in favor of iPhone over Android development”. It should be noted that Flurry derived those numbers from mobile apps that contain their tracking codes. As such, the survey reflects usage patterns from a subset which may or may not be an accurate representative of the whole market. Flurry also found out in another report from last month that mobile users are spending more time in their apps than on the web.